It is an expectation that parents seeking to enroll their wards at DPS Rohtak will give their full support to the School\'s mission. Students from all castes and creed are welcome to enroll at different levels. Applications are accepted at all levels as per the curriculum of CBSE. Places may be offered at other times when available. Opportunities to visit the school are made available to prospective parents and their wards. In the competitive world of today where we prepare the child for the future, the school motto instills values of compassion for all, irrespective of race, religion, gender or social background. It is a constant reminder that the secret of human happiness is not in self seeking but in placing the interest of others before self. Delhi Public School is a school for both boys and girls and enrolls students from all caste and cadres. The School exists to provide quality education for young children from varying socio-economic and cultural backgrounds. 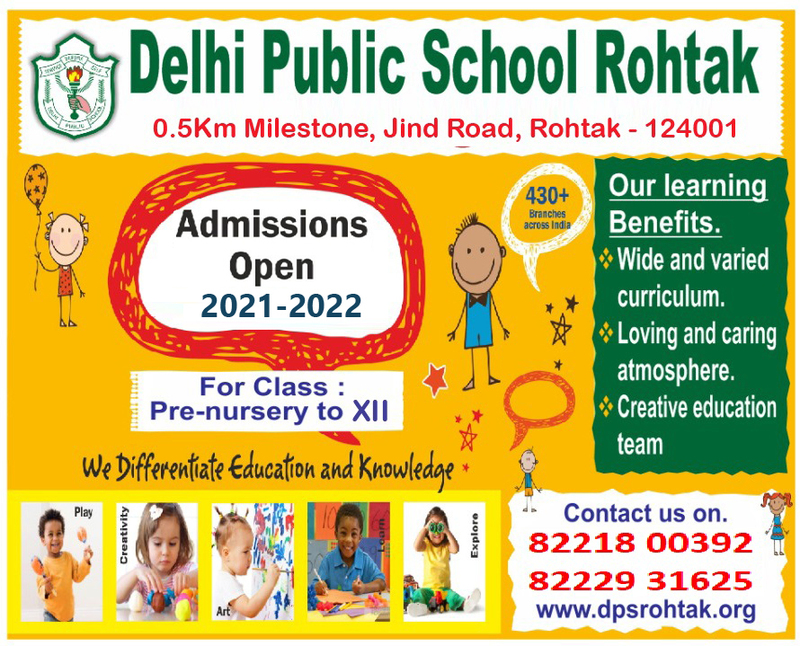 Parents/caregivers seeking to enroll a student at Delhi Public School Rohtak must take an admission test and the admission in Delhi Public School Rohtak is primarily based on this test. Parents/caregivers seeking to enroll a student at Delhi Public School Rohtak must give a commitment to supporting the mission and values of the School and have demonstrated a commitment to their own faith tradition as evidenced by their involvement in their own culture and have respect for all cultures. Each application which gives evidence of meeting the primary criteria for enrolment will be considered by the Principal on its merits having regard to the priority order and factors detailed below. The final decision of an offer of enrolment rests with the Principal. The student’s past behavior and commitment at school. The School’s ability to cater for the specific talents and needs of each person. Special consideration will be given to the enrolment of students who are materially, socially, spiritually or emotionally disadvantaged. Date of receipt of applications may be used if all other priorities and factors prove equal. Where applications are received for students with special educational needs, the application will, in the first instance, be considered according to the enrolment process outlined above. In addition, an enrolment support process examining the physical, human, curriculum and financial resources of the School and the needs of the student, will be undertaken. Non-disclosure of known special needs may have significant implications for the ongoing support of a student seeking enrolment and may result in the cancellation of the enrolment process.